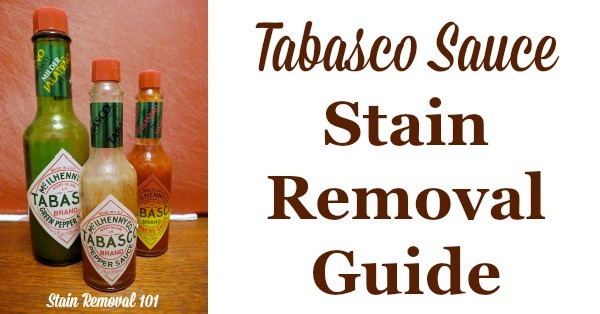 Need some Tabasco Sauce stain removal tips? You've come to the right place. 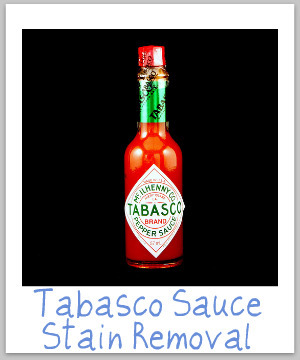 There are people who really love their Tabasco, which is a pepper sauce. They put it on just about everything. 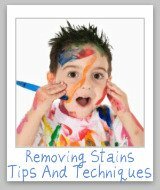 I am guessing you or your loved one loves it too, because otherwise you wouldn't need these tips for removing Tabasco stains. 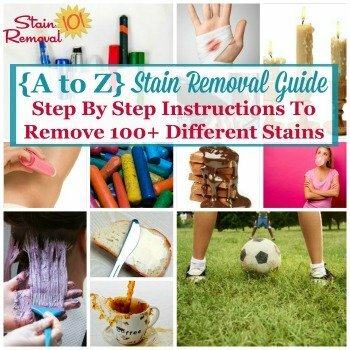 Below are step by step instructions for removing these spots and splatters from clothing, upholstery and carpet so you can keep enjoying that sauce on just about everything from eggs to pizza. 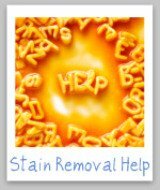 Remember, that just like many other stains it is important to treat it as soon as possible, so it does not set and become even more difficult to remove. Step 1: Run the fabric under cold running water (not warmer water), letting the water run over the back of the stain so it does not spread it further or cause the stain to travel through the garment to flush away as much Tabasco Sauce as possible. Step 2: Pretreat the stain with liquid laundry detergent, barely rubbing it in, but more like just coating the stain, and then let it sit for several minutes. Step 4: Use a white cloth to sponge white vinegar onto the Tabasco Sauce stain, and then rinse thoroughly. Step 5: Repeat steps 2-4 until you have removed as much of the stain as possible. 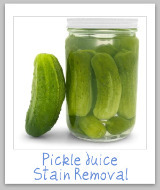 Hint: The sooner you do this after the stain occurs, the easier it will be. Step 6: Pretreat with a laundry stain remover and wash as normal. 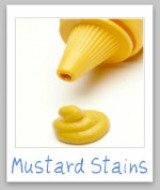 Hint: Make sure before you place the item in the dryer that the stain is completely removed. If it is not then do not place in the dryer, as it will set it. Step 7: If step number 6 did not get out the stain again coat the stained area with liquid laundry detergent and let it soak in warm water for around half an hour. Then, launder again, using either color safe bleach or chlorine bleach if safe for the fabric. Step 1: Scrape or blot off any excess Tabasco Sauce from the upholstery, being careful not to spread the stain further. Step 2: Mix a solution of two cups cool water, one tablespoon dishwashing liquid, and one tablespoon of vinegar. Step 4: Next, blot at the Tabasco stain until the liquid is absorbed. Step 6: Now that it is removed you should get plain cold water and a new white cloth and sponge the area to remove the cleaning solution, and then blot dry. 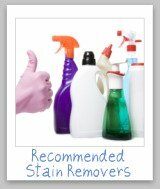 Hint: Be sure to get the upholstery only as wet as necessary to remove the stains from it. 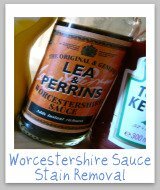 The instructions for Tabasco Sauce stain removal from carpet is the same as for upholstery. 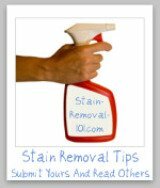 However, if you don't have luck with this method above you can also do something additional with the carpet stain, which is to mix a solution of one tablespoon of ammonia with two cups warm water, and use this as a stain removal solution. CAUTION: Since vinegar is an acid and ammonia is a base if you use one after the other in attempting to remove stains it will just neutralize the effects of both. To avoid this make sure you thoroughly remove one solution from the carpet before using another.